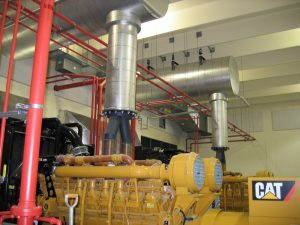 Whether you are designing a central energy plant for a hospital, or a smaller generator for a commercial facility, be sure to dedicate some time to your engine exhaust system specifications. Federal regulations are becoming stricter each day. And, at the local level, noise and air quality are becoming more and more important to permitting authorities and field inspectors. Noise attenuation is the biggest concern, of course. Excessive noise will bring unwanted attention to your installation, and this can create enormous problems for your client. If your project resides within city or county lines where a specific noise ordinance is in place, know what these limits are, and tie your specifications to those limits. Your noise attenuation specifications should set clear and measurable targets. If sound levels are measured in decibels, it seems logical that a sound attenuating device (silencer) should be specified to provide “x” dBA attenuation, when measured at a certain distance from the source (i.e. : engine exhaust outlet). Whatever you do, don’t rely solely on the silencer attenuation “grades”. These grades are used by the various exhaust system manufacturers, but they don’t mean a whole lot (read why). One last point on attenuation: When you visit the jobsite, look around and consider how the adjacent properties might reflect the sound originating from the engine exhaust outlet. Steel or stainless steel? Indoor or outdoor? Exhaust silencers are available in carbon steel, aluminized steel and stainless steel. Carbon steel silencers generally receive a primer followed by a high-heat black paint finish. Aluminized silencer are sometimes painted, but most often not. Stainless steel silencers are almost always left unpainted. The material you choose will be important if your installation is outdoors, visible to the street, or exposed to damaging conditions. As you may have guessed, exhaust silencers are subjected to large temperature swings (diesel engines produce exhaust gas temperatures in the 800°-1200°F range). These temperatures, combined with the frequent start/stop exercise cycle of generators, already create a serious challenge to the exterior paint used on carbon steel silencers. It is not uncommon to see poor quality paint that flakes off after a few engine start/stop cycles. If your installation is surrounded by a corrosive environment (think water treatment plants, chemical plants or coastal installations), rust will be a serious threat, and you should already be planning to have all exposed exhaust components built in 100% stainless steel. Want to avoid rust but don’t have the budget for stainless steel? Whenever possible, consider installing the exhaust silencer indoors. This will help in the aesthetics department and will make the architect very happy. When installing indoors, space is critical, but be aware that newer silencer designs allow low profile installations, even when the overhead clearance is very limited. If you are concerned about the high temperatures, be sure to look at internally-insulated models, or consider external insulation such as thermal wraps for any component that might present a hazard to personnel. New engines furnished by the major manufacturers in the U.S. should already be certified to meet the applicable EPA regulations concerning air quality. However, be aware that local regulations may go beyond these national standards. If the generators are run frequently, your client may also encounter complaints from nearby residents claiming to be affected by smoke or fumes. Whenever you feel that your project may require more than is required by the national standards, be sure to consult with the engine manufacturer, or with an expert in diesel engine exhaust emissions. There are plenty of well-established technologies available to control carbon monoxide (CO), nitrous oxides (NOx) and/or hydrocarbons. With the right advice, you can navigate this area with confidence and full adherence to the law (what is the law?). Let’s face it, engine exhaust systems are not pretty. We want them out of sight but also need them to perform very important functions. Can you achieve both? Yes, you can. Follow these basic points and you will be well on your way to a good design. Understand the local noise ordinances and specify an exhaust silencer that can meet those limits. A properly selected silencer can lower the engine exhaust noise while allowing the engine to produce power as expected. Consider an indoor installation for the exhaust system. If indoor installation is not an option, specify stainless steel as the construction material for any exposed exhaust elements. Be sure to weigh the additional benefits of a higher grade stainless steel, such as 316, vs. the more common 304 stainless steel. You can expect a 20-30% cost premium for the better 316 stainless steel, but the added longevity may be worth it. Understand the environmental regulations affecting your particular project. This may not be a concern for most installations, but if it becomes an issue, it can be very costly to correct after the fact. I hope these guidelines help you improve your exhaust system design specifications. Have questions? Post them below and I’ll reply with an answer as soon as possible.